Aim: To define that Keratosis Obturans is one of the predisposing factor for External Auditory Canal Cholestetoma. 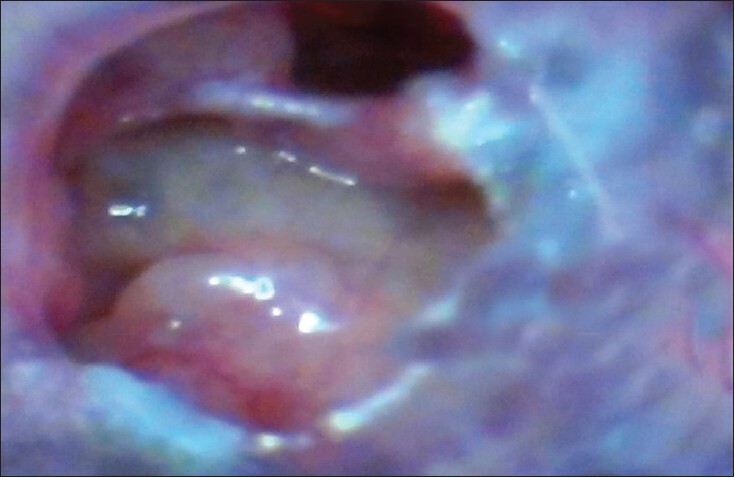 Materials and Methods: 920 patients were analysed retrospectively between July2012- March 2013 with history of dull earache, fullness and cerumen in External Auditory Canal. 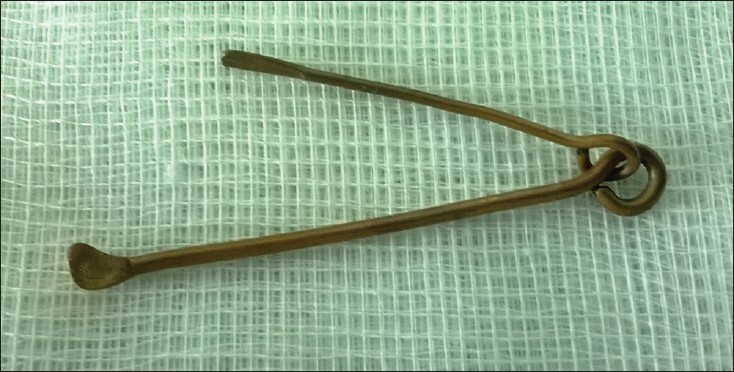 The External Auditory Canal examination was done only after removal of Cerumen. Result: Total 920 patients were examined and wax was removed sucssfully except in three patients where it was removed manually under cover of analgesic and antibiotic. 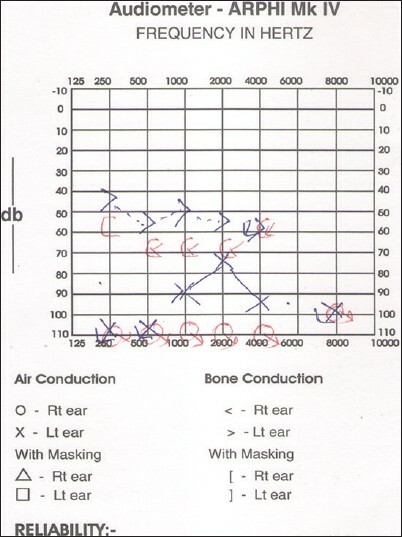 After this examination of External Auditory Canal, tympanic membrane, middle ear, ossicles was done clinically. In case -1,only inflammation was present. In case -2,both inflammation as well as widening of bony part of EAC was present along with perforation of TM left side. 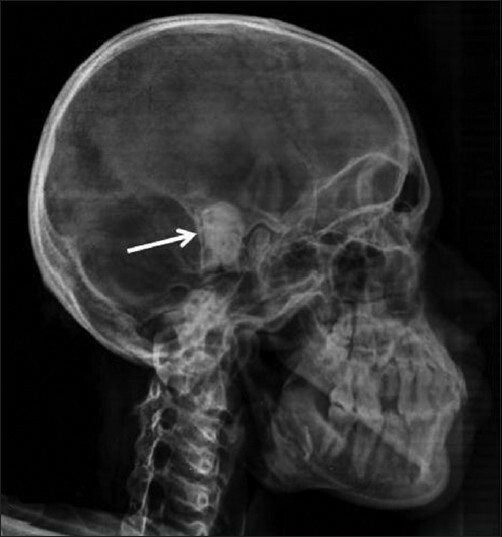 In case-3, erosion in the bony part of EAC with cholesteatoma sac. 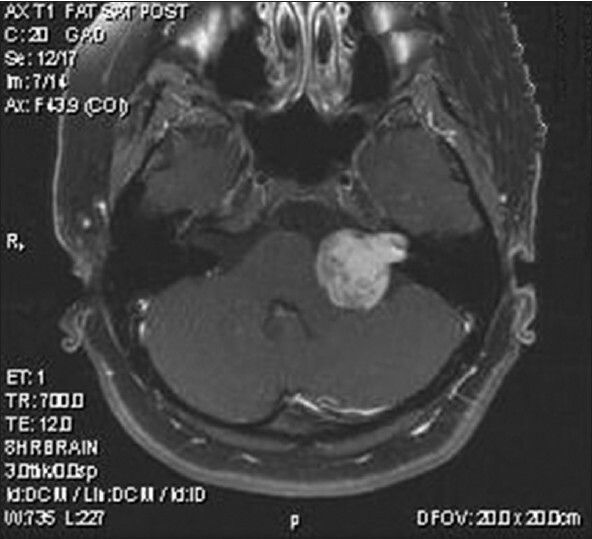 On CT scan ,there was no extention of the disease process. Conclusion: KO is uncommon and occurs mainly as desquamative process of ear canal. 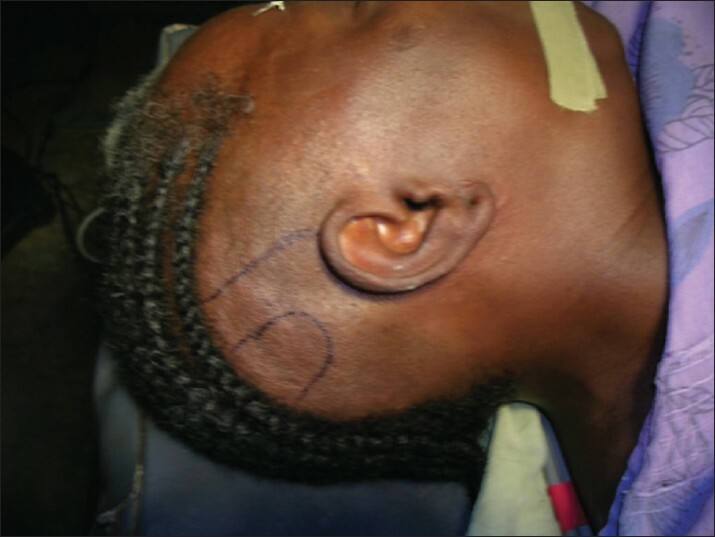 Both KO and EACC has overlapping of sign and symptoms to some extent.KO is common in comparison to EACC and later usually occur in long standing or in neglecting cases of KO. Aims and Objective: The present study was undertaken to compare the results of various autogeneous tissues temporalis fascia, tragal perichondrium, and fascia lata as graft materials for the type 1 tympanoplasty. Materials and Methods: A total of 120 cases with large, subtotal and total perforation were considered in the study. 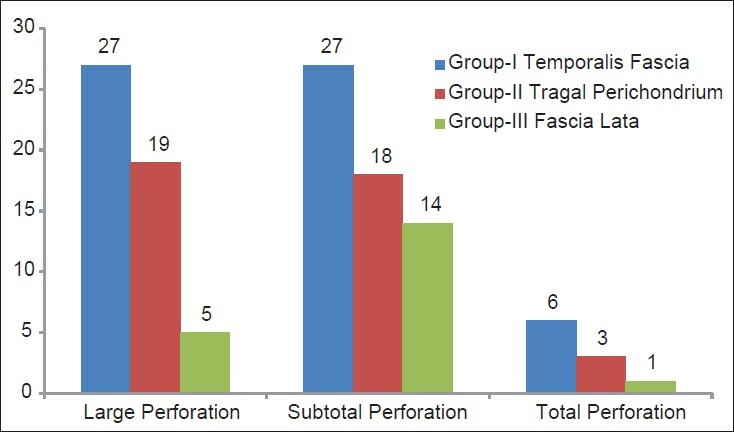 Of the 120 cases, temporalis fascia graft was used in 60 cases (Group-I), tragal perichondrium graft in 40 cases (Group-II), and fascia lata graft in 20 cases (Group-III). The results were evaluated in the form of rate of graft success, hearing gain, and mean residual air-bone gap with respect to the graft materials. Results and Observation: A nonsignificant association was observed between the groups, that is, temporalis fascia (Group-I), tragal perichondrium (Group-II), and fascia lata (Group-III) and the graft uptake. (P = 0.96 > 0.05) and air bone closure (χ2 = 2.908, P = 0.059 > 0.05). Conclusion: The graft take-up rate and Hearing improvement are similar for the different graft materials used. Size of the perforation doesn't significantly influence the success rate of tympanoplasty as per our study. Normal translucent appearance of neotympanum in the postoperative period was seen only with temporalis fascia, while in tragal perichondrial and fascia lata grafts the neotympanum was whitish, thicker, and translucent to opaque. Introduction: Occupational noise induced hearing loss causes sensorineural hearing loss (SNHL) in industrial workers who are continuously exposed to high frequency noise due to degeneration in hair cells and associated nerve fibers. Materials and Methods: This study was conducted in 100 industrial male workers, including officials, machinery operators, and helpers. 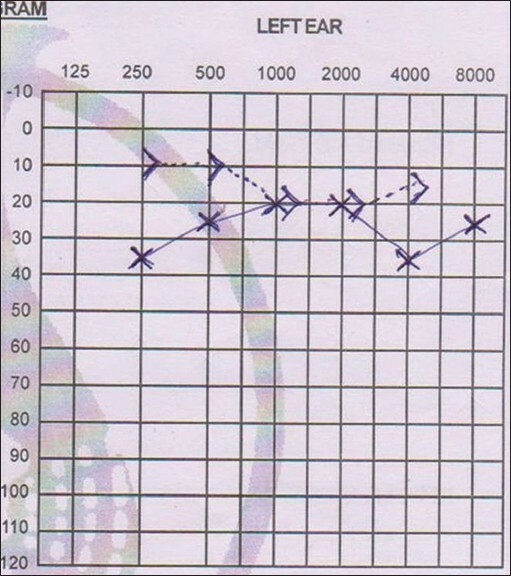 ENT and audiometry examination were done and noise level was measured. The age, noise level, duration of exposure, type of activity, and measurement of hearing loss were co-related. Results: The workers who worked in machinery area were affected more when compared to official and helpers. The age group 36-40 was affected more when compared to other age groups. Conclusions: Chronic exposure to noise is common hazard in industrial workers that affect bilateral cochlea and causes high frequency SNHL with 4 kHz notch. We observed 39% industrial workers who were exposed to noise level >87.3 dBA, for 8-12 h/day in textile and hard strip rolling mills in spite of noise free machine are recommended suffered from SNHL. Sudden sensorineural hearing loss (SNHL) is an emergency in otolaryngological practice. The exact cause, in most of the cases cannot be found. A triad of vascular, viral, and membrane rupture are the known theories for the causation of sudden SNHL. Now various autoimmune disorders have also been suggested to play a role in the pathogenesis. Autoimmune inner ear disease in human being is an uncommon, but a distinct clinical entity. The diagnosis of the inner ear autoimmune disorder depends mainly on relatively distinct clinical course, immune laboratory tests and treatment response. 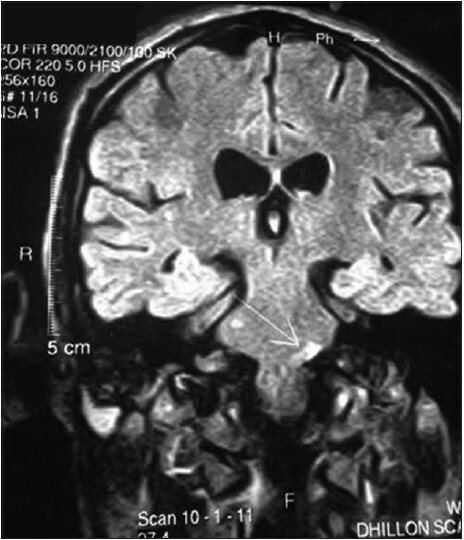 The clinical picture usually consists of bilateral SNHL, bilateral reduced vestibular loss and symptoms of pressure with tinnitus and rarely tissue destruction of middle and external ear. Systemic scleroderma is an aggressive multi-system and multistage connective tissue disorder with high mortality. It is characterized by proliferative vascular lesion and marked deposition of collagen in various tissues and organs. Responses to immunosuppressive drugs are cited as evidence of an autoimmune process. Over 250 million people suffer various degrees of hearing loss globally with 75.0% living in sub-Saharan Africa out of which about 2.8% resides in Nigeria. The degrees of hearing loss vary from mild to profound. Cochlear implant is the preferred treatment for profound hearing loss. However, the treatment for severe to profound hearing loss is very challenging in our environment. It is thus the aim of this communication to highlight our experience in the management of the profoundly deaf over an 8-year period. Six patients had cochlear implantation (CI) for profound hearing loss made up of four postlingual and two prelingual hearing loss implanted 17.5 and 1.8 years, respectively after onset of hearing loss. The first two were done as inpatients in Nigeria (2005); whereas, the rest were as day cases in USA (2012). Their ages ranged from 3 to 50 years with an average age of 29.8 years. Prophylactic antibiotic were administered to the Nigerian group, while the USA group had full 10 days antibiotic course. The Nigerian group had explantation, but one patient out of the Nigerian group later had successful implantation on the opposite ear in USA. The implantation in the United States group was uneventful. The prelingual deaf are still undergoing rehabilitation; whereas, all the previous postlingual deaf patients have resumed work. CI for the profoundly deaf is feasible in Nigeria with proper planning, collaboration between local and international teams. However, there is the need to ensure an optimal environment and personnel training for a highly successful cochlear implant program in Nigeria. Transtympanic (medical) therapy is an attractive and convenient technique gaining acceptance all over the world, where the drug is placed in the middle ear with the intention of treating inner ear diseases like hearing loss, vertigo, and tinnitus. 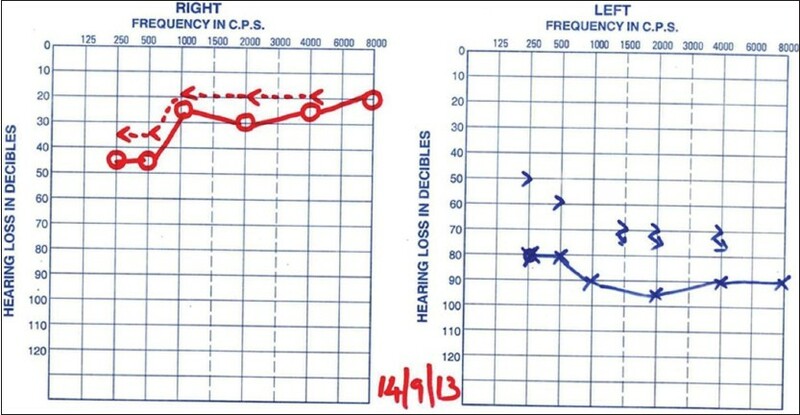 We report a case of sudden hearing loss managed with transtympanic injection of dexamethasone improving the hearing loss and tinnitus almost completely.